This is the first time that I did a shameeah of an organ. In my desire to find new ways of dealing and hopefully of healing diabetes, I needed to understand more about the pancreas, the organ primarily affected in diabetes. I knew about the physiological functions of the pancreas but I had no idea about its place in the energetics of our organism. I did not know what it represents, what kind of emotional problems might play out there. The material we used for the shameeah was a little bit of a sheep’s pancreas. 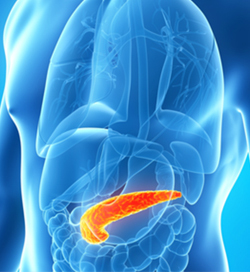 The pancreas felt like a highly energetic organ. We felt warm, sometimes even hot, the images that came were about anger, fire, light and love. Pain had a pulsating character also, it was a sharp, stabbing pain. Senses were acute, especially smell. Most of us felt nauseous. The pancreas seemed to have a position above the other organs with the exception of the heart. It is in control of the energy flow in our body. Sugar is the energetic currency in the organism and the pancreas oversees its flow and metabolism. It felt like a center of power and authority. It is not seen, it is hidden: a hidden leader. However if it is ignored, when it is affected, then it is a deep problem. Pancreas is core, it is a core organ. It was experienced as a general or a Zen master, clear, stern and unyielding. It is an uncompromising organ, when it speaks, you have to follow. The question came up: Am I in control of my life or do I follow someone else’s drum? In the pancreas memories are stored. Joyful, sweet memories came up as well as painful ones. “Anger hurts the liver, resentment, hidden and unexpressed anger hurts the pancreas.” Clear and open expression was felt to be necessary for this organ to work properly. Very early in the trituration, participants mentioned that it seems to have a lot to do with spirituality. This culminated in the complementary experiences of two participants. One followed intensely a spiritual path, yet underneath there was a lot of unexpressed anger with the desire to blame others, a lot of old pain and grief, that never had been talked about with the people involved in past hurtful events. She happened to be diabetic. This is the organ of enlightenment. It is also the major organ being affected in addictions.